1 What’s The Best Type Of Hummingbird Feeder? 1.1 Are There Specific Features You Should Look For? 1.4 Is The Feeder’s Shape Important? 1.5 What About Bees And Ants? 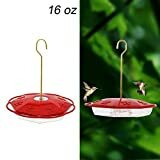 2.4 What Should You Feed Hummingbirds? Hummingbirds are wonderful garden-dwellers. Not only are they adorably cute with their super-fast blur of wings and tiny bodies, but they can be great pollinators. Often, we want to encourage them to stay by buying the best hummingbird feeder we can find and providing extra food. But what really works to draw hummingbirds? Do you know where to place a hummingbird feeder for the best chance of drawing birds? How to clean a hummingbird feeder? What should you put in it to keep your birds healthy and safe? I’ll discuss what works and what doesn’t work, and whether glass hummingbird feeders are better than plastic ones. But more than that, I’ll help you learn how to care for your hummingbird feeder, how to maintain it and clean it, and how to encourage these cute little birds to visit. 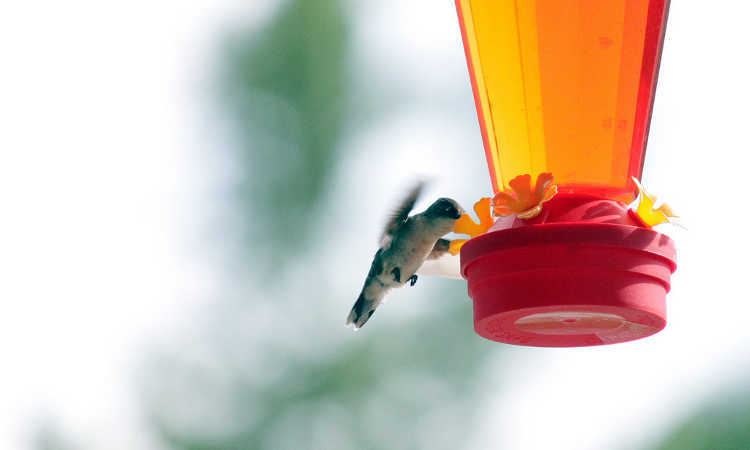 What’s The Best Type Of Hummingbird Feeder? There’s so many variations on hummingbird feeders now that it’s hard to choose between them. Let’s go over some aspects which you may not have considered, and talk about what works and what doesn’t. 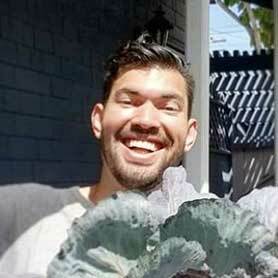 Are There Specific Features You Should Look For? 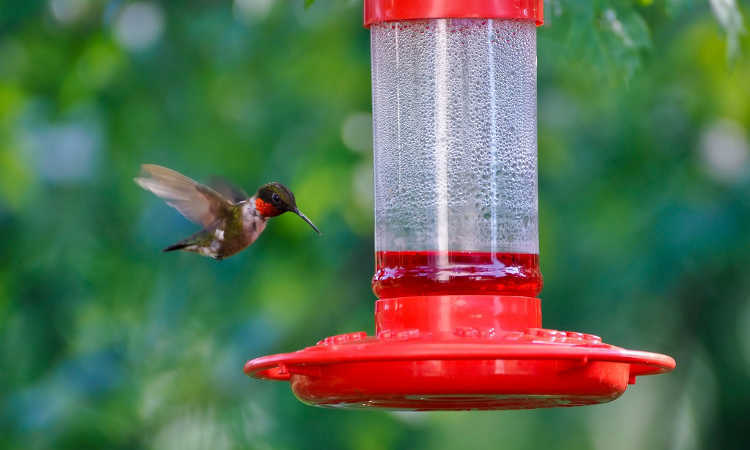 Basic features on a hummingbird feeder include a reservoir and a feeding hole or tube. But it can become much more complex from there. 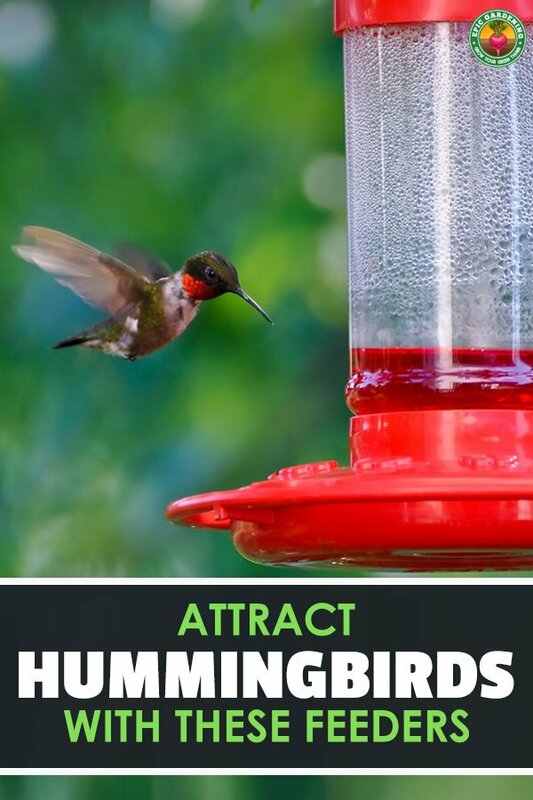 If you want to attract multiple hummingbirds at one time, you’ll want a feeder that has more than a single feeding hole. These will need to have a medium to large reservoir as well to handle traffic. People who want something that’s easy-care may want a larger reservoir so nectar changes can be spaced out to every few days. Something that’s easy to clean like a wide-mouthed glass reservoir is also a good choice. Only trying to attract hummingbirds, and not other varieties of birds? Choose a feeder that has no easy landing space. Hummingbirds can easily feed while hovering, where orioles or other nectar-liking birds need a perch to land on. There are other features, but those are the basic necessities for most people. Read on to find out about other things to consider! Honestly, this usually is a matter of personal preference, as both types of feeders have benefits and drawbacks. Plastic hummingbird feeders can get damaged by the sun’s rays more readily, and are more subject to cracking over time. But they are lighter in weight and are less expensive, plus they are available in a wide number of shapes and styles. Glass hummingbird feeders are much heavier and resistant to sun damage, but if they fall, they will shatter, so you need a secure place for it. In addition, they can heat up more readily if they’re in direct sunlight. However, these are much more ornate and can be little works of art. Both materials work fine, but you’ll need to pick what works best for your location. I’ve used both with good results. Most hummingbird feeders have red on them, as it’s claimed that the color red draws hummingbirds. This is true, it does! However, other colors that resemble the shades of flowers will work just as readily. The real goal is to have something with bright colors that catch the eye. Whether it’s brilliant blue, hot pink, or the more traditional red or yellow, all of these can lure a hummingbird in for a drink. Clear models have been tried and have proven to be rather ineffective. Is The Feeder’s Shape Important? Yes – shape matters. But it matters most in how it’s used and cared for, and in how it should be placed to entice birds closer. There’s a few basic styles, and all of them work. 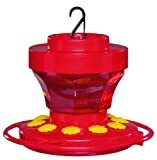 The most widespread style is a top reservoir hummingbird feeder. These models have a large container on the upper part of the feeder, with the nectar access at the base. These make it easy to see how much nectar is left in your hummingbird feeder. However, top reservoir styles leak more readily. They can also be much more complex to clean, especially those with bottle necks or other narrow-necked designs. 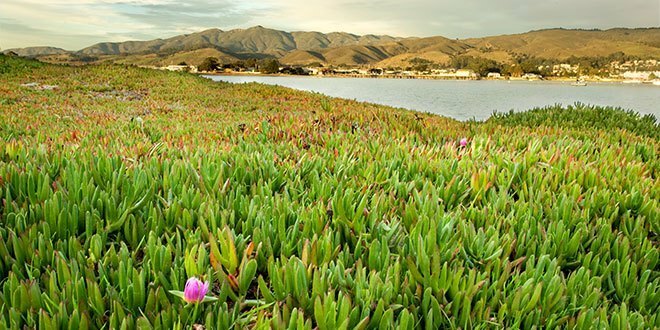 These are also quite visible to birds and may draw more than just hummingbirds for a drink. A more recent style is a saucer-style. These have a reservoir base with the feeding tray on top. Designed to be mounted on poles or placed on flat surfaces, these are usually not hung up. If you’re crafty, these can be modified for hanging. Saucer bases are usually opaque. You need to open it to check the nectar level. They also don’t have as much capacity. Since they’re smaller, birds won’t see them as readily, so it takes time for them to get into regular use. But they’re easy to clean and maintain! New models boast of being window-mounted. These are based on saucer-style models with a base reservoir, but include suction cups which secure to the window. Again, these have smaller reservoirs, and because they’re close to the house may take longer to get regular visits. What About Bees And Ants? Many commercial feeders use yellow ant guards around the nectar holes which look flower-like. Bees, wasps, and other flying insects may be enticed by the color yellow. If bees or other flying insects seem to be congregating around your feeder, consider eliminating the yellow parts. You can paint them another color, or just pop them off entirely. The choice is up to you! Planting bee-friendly plants will also draw the bees away from the feeder. 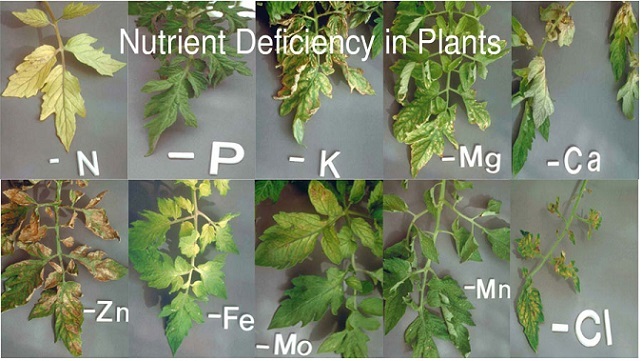 They prefer natural plants over sugary solutions. Ants are always looking for sugary things, and the nectar in your feeder certainly qualifies. Some feeders are available with ant moats on them. These small pools of water prevent the ants from reaching the feeding holes, but need to be regularly refilled. I find that using a hanging feeder with some sticky tape on the wire will work to keep ants at bay. If you’re worried about the birds crashing into the sticky tape, paint sticky bands of arborist paint on the branch where you hang your feeder, preventing ants from reaching the wire. Pole-mounted feeders can have arborist paint on the post to prevent ants from climbing up to the nectar. However, feeders which sit on tables or are mounted on windows are harder to protect from interloping ants, so you may want to avoid those if ants are a problem. Once you’ve selected the best hummingbird feeder for your needs, you’ll need to know how to take care of it. Otherwise, you’ll be buying a new one to replace it far too quickly! Here’s some insight into the proper maintenance of your feeder. Placement isn’t just important for you, but it’s important for the hummingbirds, too. You will want to put your feeder in a shaded location, ideally within about 10 feet of some form of large plant or tree. This provides the birds access to cover in case they need to hide for short periods of time. Further, it’s important to have your feeder in a location that cats or other animals can’t reach. Many people hang their feeders for precisely this reason, but even if you have a model that doesn’t hang, be sure it’s in a safe location for the birds. Make sure your feeder is visible. This guarantees that the hummingbirds can find it to come have a drink! Don’t place your feeder really close to a window unless it’s directly attached to the window. While we love to watch hummingbirds come in for a landing, having a large see-through panel nearby can be a flight hazard. Ensure your feeder is at least 3 feet away. If you do have to hang your feeder near the window, place a decal or cling decoration on the window. This makes the window more visible to the bird and prevents collisions! Finally, be aware that hummingbirds can become territorial. You may need to have more than one feeder in your yard, especially if one particularly stubborn hummingbird decides not to share while he or she is visiting. Cleaning your hummingbird feeder thoroughly is a necessity. That sticky sugar nectar can develop mold or spoil quickly, especially if it’s positioned in direct sun. Bring the feeder inside and rinse out the interior with hot water. Then, with a soft-bristled brush and some standard dish soap, wash it thoroughly. Get deep into any grooves where nectar might have been, and try to clear out obstructions in the feeder holes. Once you’ve gotten the interior and exterior cleaned, make sure that there is no soap residue left. You may need to do multiple rinsings. Also, be sure the feeder doesn’t smell of the soap you just used. If it does, let it dry and see if that reduces the scent. Unscented soap is best. If you have a feeder which has a slender neck like a bottle-neck style, you may need to be more creative. Narrow bottle brushes used for cleaning out the mouthpieces of water bottles can assist with this. No bottle brush? No problem. Use some clean playground sand in addition to soap and water. Place it inside the bottle with the soapy water, close the top, and shake the feeder until the sand has scoured the inside clean. Then rinse it all out and get rid of all the soap residue. A leaking feeder doesn’t just waste the nectar, but also causes a whole host of other problems. It can draw pests or other animals who are lured to the sweet, sticky mess. 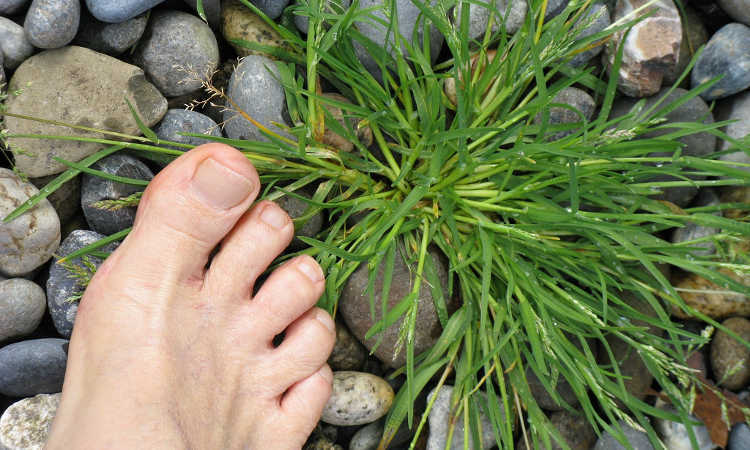 Plants or grass can be damaged. And, of course, it’s sticky, which means it puts the hummingbirds themselves at risk as it can get on their feathers. 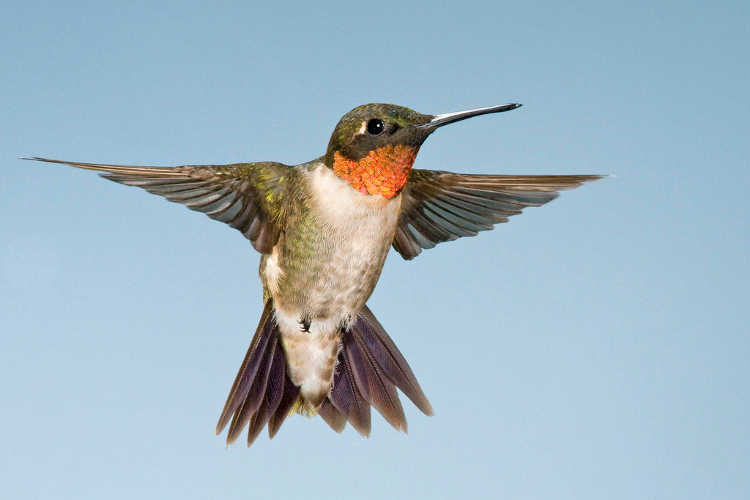 Any stickiness on the flight feathers can slow or stop a hummingbird from flying. So it’s essential to try to minimize leaking as much as possible. While only styles with the nectar reservoir below the feeding tray eliminate leaking entirely, there are tricks you can use to reduce the leaking from a top reservoir model as well. Ensure your feeder is kept consistently half-full. When you fill your top-reservoir feeder halfway or more and then screw on the base, it creates a vacuum when it’s turned right side up. The vacuum will reduce as the feeder gets low, which can cause leakage. But don’t overfill your feeder, either. Too much liquid in the feeder will also cause it to leak. There’s generally a fill line, and you should make sure to fill to the right level for your feeder’s design. Check the seals in the feeder regularly to make sure they’re still properly functioning. If necessary, replace them. If you can’t find replacement seals, you can use plumber’s tape around the joint to help provide a clean seal. Make sure your feeder is in full shade. Not only does this protect the feeder against sun damage, but it slows evaporation inside the reservoir. 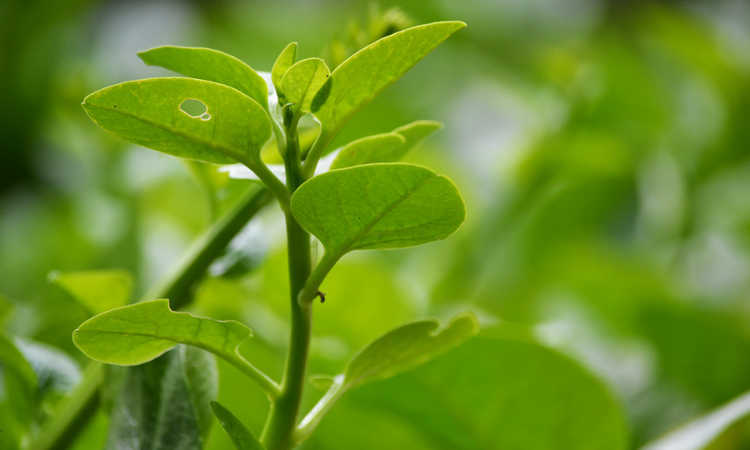 If it’s in full sun, pressure can build up as the nectar evaporates and can speed leaking. What Should You Feed Hummingbirds? 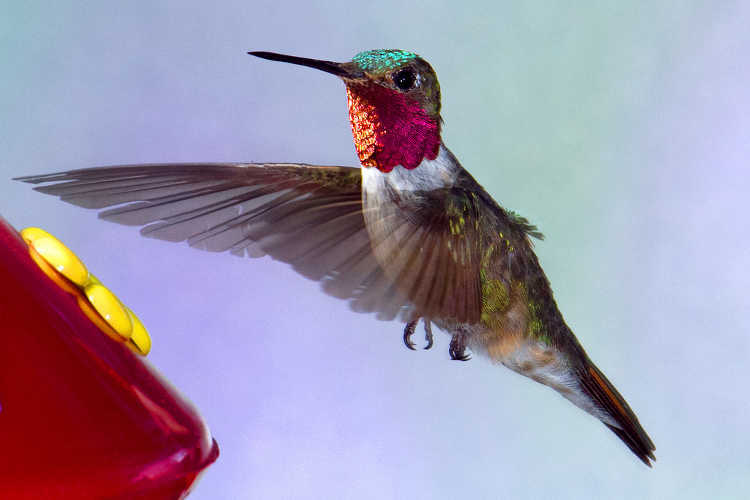 Nearly all feeders come with a red-colored hummingbird nectar. However, the dye is not particularly healthy for hummingbirds. Thankfully, it’s easy to make your own nectar at home. Combine one part white granulated sugar with four parts water, and thoroughly stir it together until the sugar all dissolves. You can store excess nectar in the refrigerator for a week or two with no ill effects, but if it starts to cloud, make a fresh batch. Change the nectar in your feeder at least twice a week, and every 2 days in hot weather. Sugars will break down more readily in hot weather and can spoil faster. If the nectar is cloudy or looks dirty, wash the feeder and replace it with fresh nectar. When the nectar in the feeder starts to spoil, it can ferment and make hummingbirds sick. They might stop by once or twice, but then they won’t come back. You need to keep it fresh to have birds visiting all the time. Let’s begin with a traditional style of glass hummingbird feeder – the standard red variant, but in glass. What I love about this Perky-Pet model is that they take everything into consideration. The top of the model acts as an ant moat to prevent ants from reaching the feeder holes. All four of the feeding holes have bee guards overtop to keep bees at bay. Two versions are available: a clear glass reservoir, or a red glass reservoir. Both are translucent so you can see the liquid level inside. In addition, they’re easy to disassemble for cleaning, which is a great perk, and the reservoir is not narrow enough to require special cleaning methods. All things considered, if I were going to opt for a hanging feeder, this is where I would start. It’s a classic design that easily lures in hummingbirds, and deserves to be among the best hummingbird feeder choices today. For something a bit brighter in the garden, we have this model from Grateful Gnome. 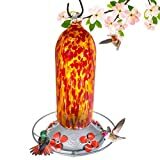 In brilliant colors of red and yellow, this blown glass hummingbird feeder will certainly attract attention no matter where it’s placed! The base is wide, ensuring it’s easily cleaned. I’m a bit saddened that it doesn’t include bee guards or an ant moat, but despite that it’s a beautiful choice. It can easily be secured using a wire or a hook of your choosing, and makes for an attractive hummingbird station. In some ways, I actually prefer the Best Home Products brightly-colored model to Grateful Gnome’s, but in other ways I’m still disappointed. Like the Grateful Gnome model, no bee guards or ant moats are in evidence. However, what is present is a cage rather than a glass hanging loop, which adds extra stability and damage prevention. It’s even brighter than the other as well, in vibrant shades of green, blue, red and yellow. For this model, my biggest complaint is the need for a narrower bottle brush to clean it. The neck tapers just enough that a standard kitchen scrub brush won’t work well for that task. However, it’s not impossible to do despite that, and it looks wonderful when hung up! I can’t forget the glass hummingbird feeders in the saucer configuration. This Wild Wings bottom reservoir model has all of the color variety of Best’s hanging model, but in a smaller, easy-to-clean saucer style. It comes with a hanger, but can also be placed on a table if you’d prefer. This model is dishwasher-safe, and even the flower shapes on the feeding holes can be washed that way. The bottom reservoir ensures that it’s a leak proof hummingbird feeder even if it’s filled to maximum capacity, and as long as it’s kept clean, it’ll last for years and years. One of the best things about this 16-oz hummingbird feeder is its low profile. Unlike most top reservoir models it doesn’t have a long extended body. Instead, it opts for width, enabling up to ten hummingbirds to feed at one time. A built-in ant moat is in the upper portion of this First Nature feeder, preventing ants from climbing down from its included S-hook. However, it can also be used on a flat surface in the same way most saucer-style feeders can. All things considered, I think this is the best hummingbird feeder of the plastic variations, but it depends on your method of use. For me, this is about perfect. Looking for an option which doesn’t need to be hung from a tree? This two-pack of 3-oz hummingbird feeders come with helpful pole supports. Built in on the front is a bee guard to keep insects at bay. A simple loop or two of sticky tape or arborist sticky paint on the hanging post will prevent ants from getting into the nectar. 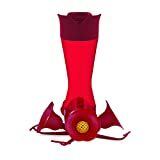 These can be positioned right in the midst of your flower beds, giving birds easy access to both nectar and flowers. Is the color yellow luring bees too close, and you have a lot of birds to feed? If so, consider this large-capacity hummingbird feeder. Another First Nature offering, this model features a clear polymer wide-mouth reservoir mounted on a solid red base. Easily cleaned, it’s a great option for people who have entire flocks of tiny fluttering wildlife. My only real complaint is that it doesn’t include ant or bee prevention other than the lack of yellow coloring, but it’s a nice, streamlined model nonetheless and will work well for the price! Let’s look at another saucer-style hummingbird feeder now. This 8-port hummingbird feeder lacks the extended flower blossoms, making it super-easy to clean both inside and out. In addition, it’s simply red and clear, with no other colors, so bees won’t be as drawn to it. Built into the top is a shallow ant moat. I think a slightly deeper one would prevent ants for a bit longer without needing to be refilled, but it works well. This model can be set on a flat surface or hung with the included hook, making it a good choice no matter where you need it to go. Do you want a feeder that can not only go on your window, but on your RV or your deck railing? Aspects has you covered. With a mounting bracket that can be used with both suction cups or deck screws, this small 8-oz bottom reservoir option delivers. Three feeding holes are in the lid, and it’s extremely easy to clean. Designed clear with a red top hatch to draw in the birds, it’s a simple but effective small-scale option that really provides good results. Last but not least is this cute little double feeder. Two upper reservoirs hang from a dual-sided window hook, with a single feeding hole in each. The smaller capacity means that it’s fine if you’ve only got a few birds in your yard, but may not work with larger populations. I really like the visual appeal of this model, and the suction cup it comes with is surprisingly sturdy. If there’s a singular complaint I have, it’s that it can leak from the feeding hole on occasion, so shouldn’t be placed somewhere where dripping becomes problematic. Otherwise, this is a great little model, and it looks and acts just as it should! 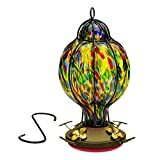 I know that I’ve barely skimmed the surface of finding the best hummingbird feeder on the market, but there’s so many that I had to limit myself to my top picks. Do you prefer a top reservoir or bottom reservoir model, and are there features you wish your feeder had? Let me know in the comments! This Hummingbird Feeder was the best gift to my mother-in-law this mother’s day. I was travelling to her with my husband and she was like – What have you brought for me? Sitting in garden, most of the time, this bird feeder brought sparkle in her eyes as if she got every thing she needed. Lolz.. Anyways, no matter it made her happy. 🙂 Keep it up guys.. 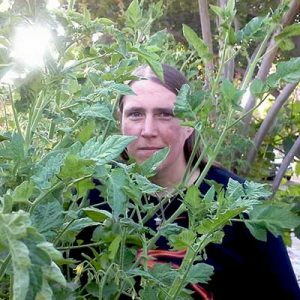 I really appreciate you covering all the topics related to gardening.